Abu Dhabi: Catholic clerics from Arab countries stated that the UAE is a prominent model of tolerance and a centre of religions, cultures and civilised dialogue, which is reflected by the planned visit of Pope Francis, head of the Catholic Church and Dr Ahmad Al Tayeb, Grand Imam of Al Azhar, to Abu Dhabi. In statements to WAM, the clerics said that the visit will highlight the UAE’s leading role in promoting the values of Islam in the region and around the world, and will have a major significance in exceptional times, while involving two key religious and political icons who will work together to combat the discourse of hatred adopted by many extremist groups. They added that Abu Dhabi’s hosting of the Human Fraternity Meeting will reinforce its position as a global centre of tolerance and moderation. Joseph Absi, Patriarch of Antioch and All the East, Alexandria, and Jerusalem of the Greek Melkites, said that Pope Francis’ visit to the UAE during this time has acquired significant importance, as it will convey a message of love to all peoples of the region and create opportunities for dialogue among various religions, based upon mutual respect and the rejection of extremism. He also noted that the UAE is an ideal location to launch this noble message, as it embraces over 200 nationalities living in the country. He went on to say that the UAE has taken a leading step by establishing the Ministry of Tolerance and supporting key forums and meetings that call for tolerance and dialogue among religions, such as the Universal Fadoul Alliance, the Forum for the Promotion of Peace in Muslim Societies, and other initiatives that aim to counter extremist movements. Absi pointed out that the awaited Human Fraternity Meeting between Pope Francis and Dr Al Tayeb will express a message of love and call for unity and peaceful coexistence among the peoples of the world. Any meeting between such prominent religious leaders will positively affect people and will create much needed positivity and comfort, during a time when communities are facing the threats of terrorist and extremist groups, he added. He said he also hopes the visit will result in recommendations and the creation of programmes that launch general and popular dialogues on peaceful coexistence, while affirming that the UAE is capable of benefitting from the outcomes of the visit to serve peace and tolerance around the world, in light of its leading experience in this area. Absi revealed that Pope Francis will be accompanied by senior Lebanese clerics and is keen to highlight the presence of the church in Arab countries, to remind its members that they are among the indigenous peoples of the region and to showcase the love of Christians. Joseph Gebara, Archeparch of the Melkite Greek Catholic Archeparchy of Petra and Philadelphia in Amman, said that the key message of the visit will express the love of the UAE people for all peoples of the Gulf and Arab countries. He added that the meeting between Pope Francis and senior Islam clerics, led by Dr Al Tayeb, will be a meeting of brothers that seeks to promote love, modesty and openness. Gebara expressed his confidence in that the visit will have a positive overall influence, especially in terms of religious dialogue, social unity and the rejection of hatred and extremism. “We expect the visit to close gaps and reinforce the unity between Christianity and Islam, especially in terms of fighting poverty, oppression, ignorance, human exploitation and trafficking, and promoting peace in all countries, especially Arab countries,” he added. 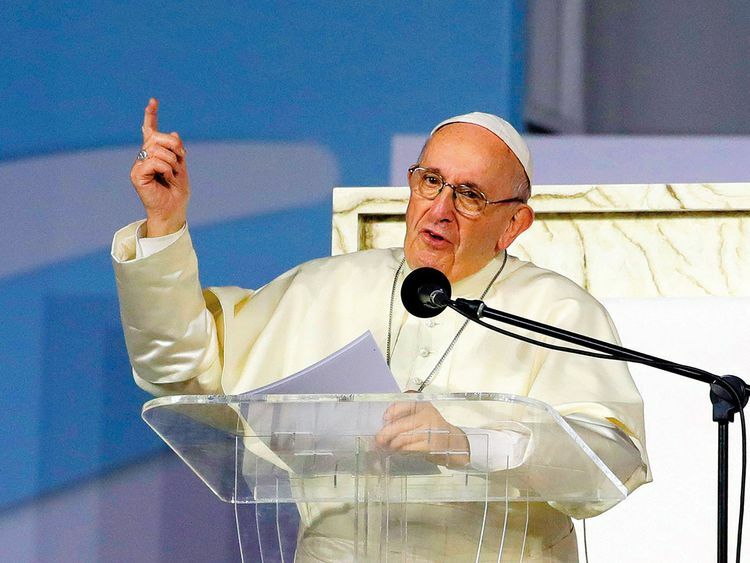 “We are confident that the Pope will be among his family during his visit to the UAE, as being accompanied by Arab Christians reflects the hospitality of the Emirati people and the generosity of the UAE’s wise leadership and officials,” Gebara continued. Father Hany Bakhoum, the official spokesman for the Catholic Church of Egypt, said that the visit of Pope Francis to the UAE confirms the country’s environment of tolerance and co-existence. He also highlighted the importance of the spiritual and religious summit that will be held in Abu Dhabi, under the title, ‘Global Conference of Human Fraternity’, which will see prominent religious, intellectual and media personalities from across the world. Father Bakhoum noted that the entire world is looking forward to the outcomes of the conference, which will aim to promote dialogue and peaceful coexistence among communities and religions, and combat extremists groups that threaten international peace and stability. Bakhoum explained that a delegation from the Egyptian Catholic Church will participate in the first ever visit by the head of the Catholic Church to the Arabian Peninsula. The visit will include a tour of the Shaikh Zayed Mosque, a Holy Mass at Zayed Sports City in Abu Dhabi and a meeting with the Muslim Council of Elders, headed by the Grand Imam of Al Azhar. It is anticipated that more than 135,000 people from the UAE and from the wider region are expected to attend the mass which will take place on February 5, 2019.